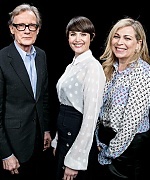 Back on Thursday, March 23, Gemma – together with Bill Nighy and Lone Scherfig – were guest at AOL Build, for promoting their new movie Their Finest. Check the gallery to see some photos of Gemma and the trio during the interview, and below you can also watch the entire interview! Big thanks to Emily from The Claflin Place for donating most of the photos!